25—28 October 2016: the international and local design crowd descend upon Dubai to attend Dubai Design Week 2016; marking just its second outing. Held under the patronage of Her Highness Sheikha Latifa bint Mohammed bin Rashid Al Maktoum — in partnership with Dubai Design District d3; with the support of Dubai Design & Fashion Council, and Dubai Culture & Arts Authority — Dubai Design Week 2016 brought in an impressive 40,000 visitors from around the globe; all presented with more than 150 events on show throughout the city. Set in Dubai Design District, also known as d3, Downtown Design presented the best of established as well as emerging brands to visitors. From over 15 different product categories — including furniture, textiles and accessories — Downtown Design also introduced new brands from other global design weeks (Barcelona, Beirut, Reykjavik and Taipei and Addis Ababa) to the Emirati city. 1+1+1, an experimental collaboration between designers from three Nordic countries, stood out. Hugdetta from Iceland, Petra Lilja from Sweden, and Aalto+Aalto from Finland joined forces to reimagine objects; each studio designing an object consisting of three distinct parts before mixing them up into unpredictable combinations. North Limited was a further standout among the crowd. 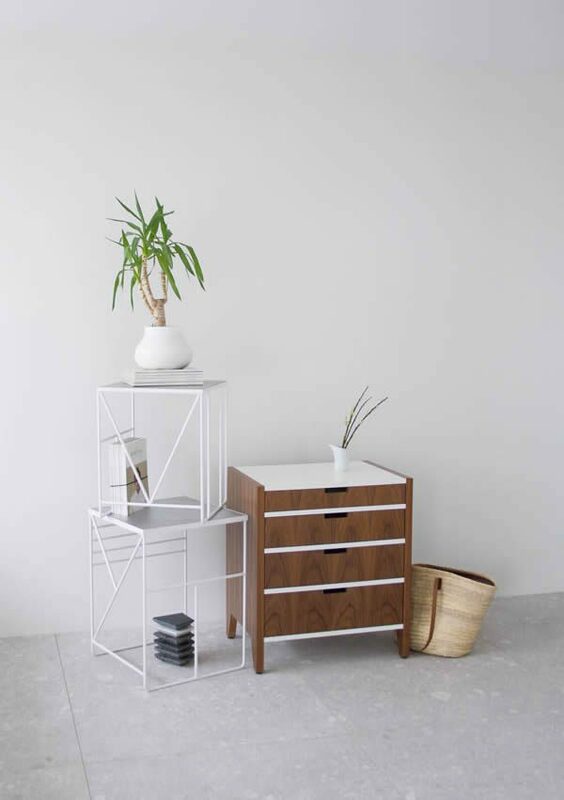 Founded by a group of Icelandic designers, Sigríður Hjaltdal Pálsdóttir, Guðrún Valdimarsdóttir, and Þórunn Hannesdóttir, the collection focuses on contemporary yet inviting designs that mix elegance with the singular quirkiness Iceland is known so well for. Curated by celebrated architect, academic, author and journalist Mohamed Elshahed, the focus was on the Egyptian capital this year with the Iconic City: Cairo NOW! City Incomplete exhibition. Celebrating the region’s emerging talents, Cairo’s continuous growth and sprawl, and tendencies to leave buildings unfinished to avoid taxation (as was referenced in its name), the show itself was an explosion of colours, patterns and playful touches. 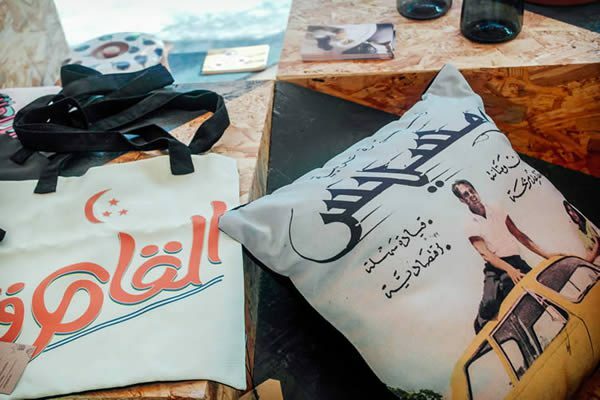 Furniture, photography, graphic and typeface design were all on show; Egypt’s online shopping store Tombokka displaying the work of the best local designers like playful tote bags, artwork cushions by REDA, and a range of accessories. There was also stunning minimal lighting by SAL, or Salsabeel Amin, who showcased his ORE Collection. 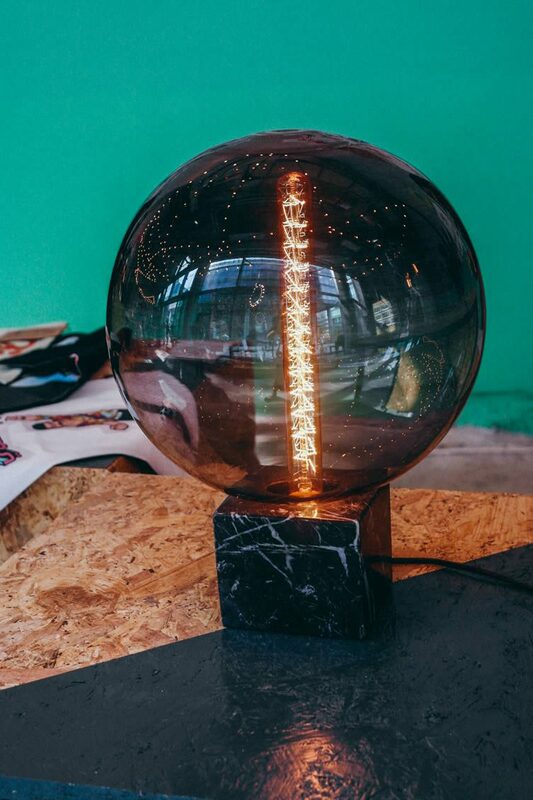 Inspired by Earth’s raw materials, SAL combines three key elements: marble, brass and glass; all beautifully executed and telling a story through the process. Marlies Schets, SEEN: Designed by Marlies Schets of Design Academy Eindhoven in the Netherlands, SEEN is a range of reflective cycling clothing and accessories which have been designed to increase visibility at night by laser-cutting a water-resistant textile and machine-woven fabric made of reflective yarn; creating cycling gear that is effective and flattering. As Schets explains, ‘simplicity, functionality and innovation are the key words. Scandinavia’s nature and culture is an inspiration to me’, the latter of which informing her range after a five-month internship in Sweden. With the motto ‘the usual becomes unusual in a subtle way’, Schets has created a functional, wearable and stylish range of gear that becomes a must-have essential for cyclists year-round. 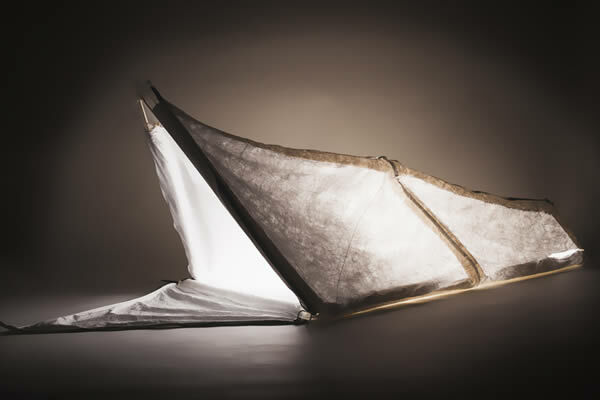 Gabriella Geagea and Anne Sophie Geay, Wearable Shelter: Wearable Shelter was designed by Gabriella Geagea and Anne Sophie Geay of the Royal College of Art; who designed an innovative garment in response to the Syrian refugee crisis. 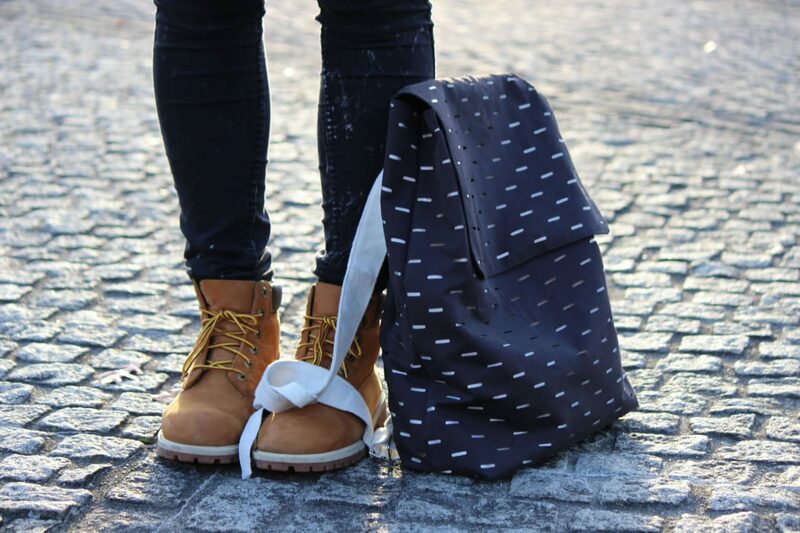 Providing light, weather-proof-shelter for families, the garment comes with three convertible functions. Made from a paper-like synthetic material called Tyvek, and insulated with Mylar (often used by marathon runners to keep warm), the garment has assembly instructions printed onto each garment, explaining its multiple functions. Serving as a jacket with large storage pockets to keep personal documents; a sleeping bag offering enough space for a parent and child when unzipped; or as a four-person tent using lightweight kite-rods, the students might not have solved the wider refugee crisis — but are certainly able to help refugees in distressing situations find temporary comfort and warmth. Nils Chudy and Jasmina Grase, MIITO: Starting out as a Kickstarter project only last year, MIITO is now an award-winning electric kettle that heats liquids directly in a vessel. Co-founded by Nils Chudy and Jasmina Grase of Design Academy Eindhoven in 2015, MIITO reinvents traditional and wasteful electric kettles into one that is efficient and easy on the eyes. 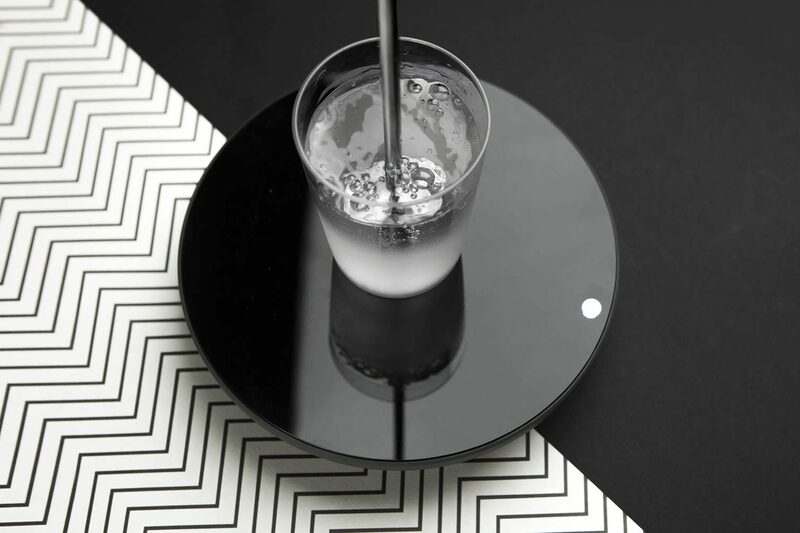 By cutting down on excess water and energy usage, MIITO allows users to select the temperature needed when heating a liquid. For instance: tea drinkers can select a temperature between 60—100℃ that specifically caters for the kind of tea being made, think delicate green tea or a hearty black brew. MIITO can also heat anything from baby food to milk, coffee to a bowl of soup; thus bringing more variety, as well as efficiency, to the kitchen. 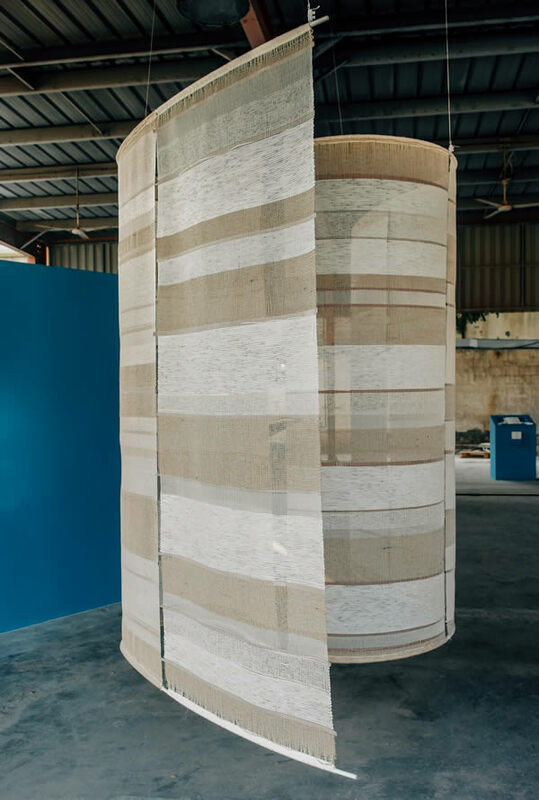 Situated a short drive from d3, DRAK — or Design Ras Al Khor, a collective design initiative established in 2015 and founded by Khalid Shafar; Khulood Thani; Nadine Kanso; and Tarik Al Zaharna — is situated at Ras Al Khor Industrial, a former tile factory sitting in a sandy location. It may be one of the oldest areas in the city, but is brimming with new design talent. 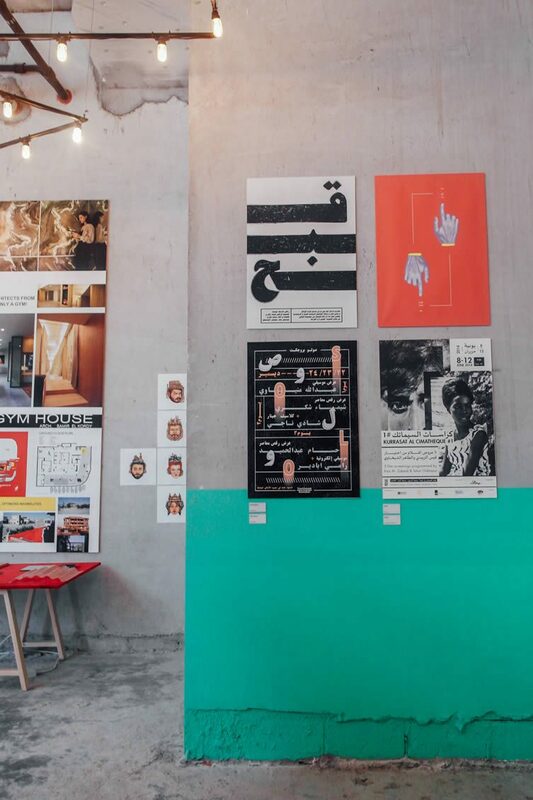 Presenting four main design projects by carefully-selected UAE-based and international designers, the exhibition coordinated with Eyes on Talents, an invitation-only digital platform based in Paris that connects emerging talent. All four projects were stunning. There was I am she, who I was or will be by visual artist, video composer and curator Hind Bin Demaithan; celebrating wood through an interactive art installation inspired by a poem, and contextually referencing the traditional Arab wood craft mashrabiya. In Figure We Wood saw Lina Younes using layering and symbolism as she explores the life of wood, and guest designer Hala Kaiksow illustrated the relevance of traditional crafts in modern design with her beautiful hand-crafted work Grain. Tulip Hazbar honoured the visual fixation and sensory experience of wood through texture in Logbook, reconstructing memories and the ritual of collecting; hoping to find answers to questions on value, transience and permanence, Hazbar does this by examining social interactions, music and objects. There was also a variety of International Projects Selection on show, including award-winning pieces like the Aleni seat by David Trubridge by the American Hardwood Export Council (AHEC), and Surfaces Sonores by Pierre Charrié; all making for a dynamic space rich in history, design and authenticity in a city that is constantly in flux, still finding its own identity. 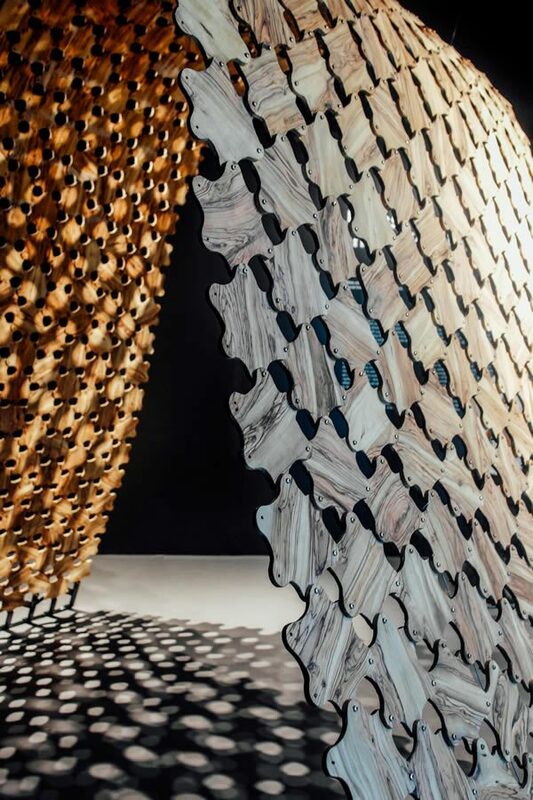 A personal highlight was Abwab, held at Dubai Design District for its second year and housed in a pavilion cluster designed by UAE-based architects A Hypothetical Office. Founded by editor of architectural publication WTD and co-founder of Center for Architectural Discourse, Meitha Al Mazrooei; Iraqi architect and designer and UAE-based Hatem Hatem; and Dubai-based architect Fortuné Penniman, AHO created a space that facilitates communication and interaction with others, perfectly reflecting the exhibition’s name, which means ‘doors’ in Arabic. This insightful exhibition showcased a range of commissioned pieces from six countries of the MENASA region — including Algeria; Bahrain; India; Iraq; Palestine; and UAE — uniting under a single theme: The Human Senses. Beginning with the Algerian pavilion, titled Tab tab fi d’zairwatam: Drumming from Algiers to Tamanrasset, the space was curated by Hellal Zoubir, displaying representations of vibrant sounds designed by Walid Bouchouchi, Souad Delmi Bouras, Mourad Krinah and Mohamed Ourrad. Users become musicians using contemporary Algerian drums; allowing for a sensory experience that unifies all. Bahrain’s focus was clear — Enriching Bahrain’s Ancient Pottery Culture — ancient craft brought back to our everyday lives by re-envisioning the identity of Bahraini earthenware. 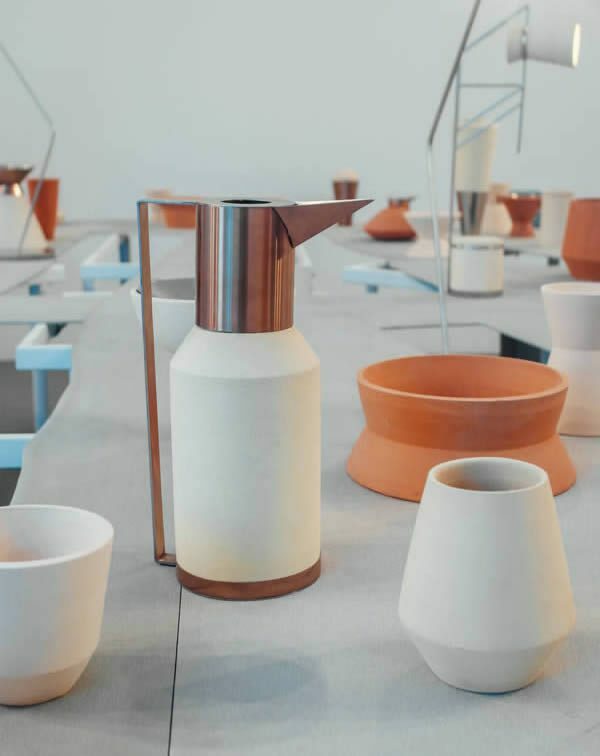 Curated by Dana Abdulghani, the team at Bahrain Authority for Culture & Antiquities collaborated with designers Maitham Almubarak and Othman Khunji to encourage renewed interest in the authentic craft of pottery. Memoir Bar was India’s pavilion title at Abwab. Visitors invited by curators and designers Thukral & Tagra to make a personal memory tile, which was then assembled into a library of memories with the aim to explore whether it is possible to preserve an emotion forever. Iraq’s pavilion was curated and designed by Rand Abdul Jabbar and Hozan Zangana, who explored the country’s multi-layered history in Excavations. With an amalgamation of overlapping civilizations, identities, languages and traditions, the exhibition drew inspiration from architecture, sculpture and script; reinterpreting their role within the 21st century. Palestine’s Mass Imperfections, curated and designed by Elias and Yousef Anastas was another fascinating display. Interestingly, olive woodcarving represents one-third of the craft industry in Bethlehem. Thus, the focus here was on monitoring and reproducing olive wood carvers’ hand-made errors; by blending the craftsman and the machine as well as promoting innovation through research in the Bethlehem olive wood industry. 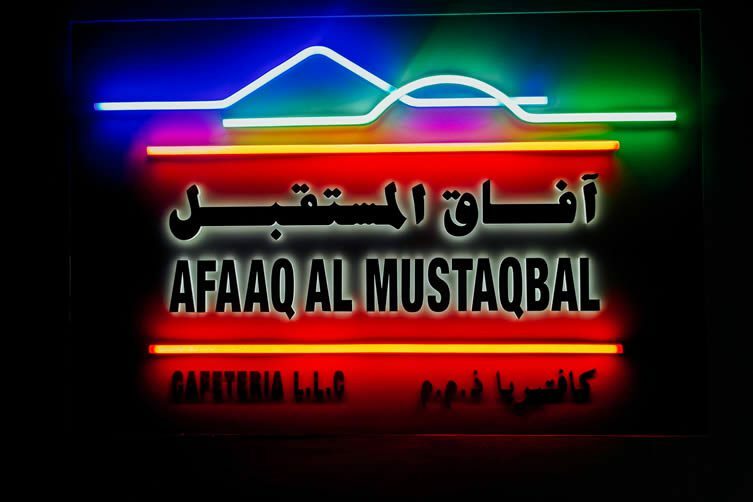 And lastly, the United Arab Emirate’s pavilion — Afaaq Al Mustaqbal — was curated by graphic designers Salem Al-Qassimi and Maryam Al Qassimi — while Salem Al Mansoori, Tarik Zaharna and Ric Hernandez were the designers behind the project, which explored cafeterias. As an integral element of the Emirati culture, the designers hoped to uncover and highlight its multiple layers and role within the UAE.